Do you ever wonder why the feathers are colorfully eye-catching, and what makes them so? The peacock's feather in all ages has been considered as a sign of beauty and knowledge; beauty because it is beautiful, knowledge because it is in the form of an eye. Peacock feathers, butterfly wings, opals and pearls are some of nature&apos;s jewels that use nanostructures to dazzle us with color. It is accomplished through the way light reaches our eyes after passing through the submicroscopic mazes within these materials. Peacocks are pheasants native to Asia and are best known for the extravagant tail feathers exhibited by the male of the species. 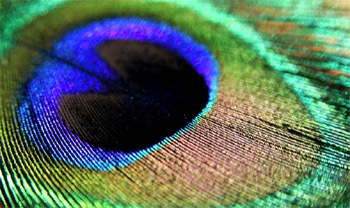 The tail of the male peacock contains spectacular beauty because of the brilliant, iridescent, diversified colors and the intricate, colorful eye patterns. Behind the stunningly beautiful plumage of a peacock lies a complex structure that changes color with the angle of incident light. Pigmentation and structural coloring are the two processes responsible for the colors in nature. Pigment is a substance that, like a dye, gives color to living and inanimate objects. For example, the color of human hair is due to pigment. If you change the view angle, color is not altered. Peacocks and other structurally colored animals and things, such as rainbows, soap bubbles and the blue sky, instead get most of their color from light reflection. As a result, while human hair can look shiny clean, it can never achieve the brilliance and radiant coloration of a peacock&apos;s tail feather. 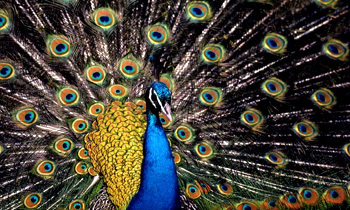 Researchers found that the bright colors of peacock feathers are not produced by pigments, but rather by tiny, intricate two–dimensional crystal–like structures. Slight alterations in the spacing of these microscopic structures cause different wavelengths of light to be filtered and reflected, creating the feathers many different iridescent hues. Inside view of a peacock feather Each branch has round indentations, with micro-lamellae on the bottom of each indentation that disperse the incident light, coloring the feathers. When peacock feathers are viewed under an optical microscope and a scanning electron microscope, they reveal a repetitive two–dimensional structure of small crystals (photonic crystals) – each with a width hundreds of times thinner than a human hair. Optical measurements and calculations showed that variation in the spaces between repeats of the crystals (photonic band gap) causes the structures to reflect light in slightly different ways and leads to variation in color. Each feather of a peacock tail possesses a central 'stem' with an array of 'barbs' on each side. Each barb, in turn, possesses an array of smaller, flat 'barbules' (a minute filament projecting from the barb of a feather). The outer layer of the barbules consists of a two–dimensional crystal framework made of 'melanin rods' connected by 'keratin' (a fibrous protein) in a lattice pattern. The number and spacing of the rods controls how light reflects which produces different colors. For peacocks, the colors are green, golden yellow, brown and a very bright blue. 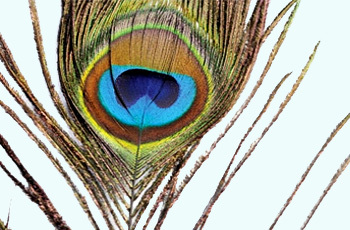 Slight variations in the arrangement of keratin and melanin are responsible for the palette of colors found in the eye of a peacock&apos;s tail feather. It is the precise structural array of melanin rods in keratin that creates different colors, with one array reflecting back yellow light, for example, and a slightly different arrangement reflecting back blue light. The eye pattern in the tail feather has a high degree of brightness and precision because the color producing mechanisms contain an extremely high level of optimum design. The colors in the peacock tail are particularly beautiful because they are bright and iridescent. An iridescent color changes with the angle of view. The colors are not produced by pigments but by an optical effect called thin–film interference that takes place in the barbules. In the eye pattern, the barbules appear bronze, blue, dark purple and green. Away from the eye region, the barbules are uniformly green. The colors in the eye feather can only be seen on the front surface of the feather because this is where the barbules are positioned. The back of the feather is uniformly brown because the barbs contain a brown pigment. 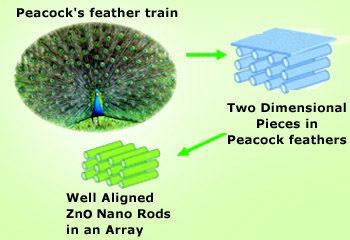 To understand how thin–film interference is produced in the peacock tail, it is first necessary to understand the detailed structure of the feather. Barblues of peacock feather The colors are not produced by pigments but by an optical effect called thin-film interference that takes place in the barbules. What is the structure of the barbules? The basic structure of the peacock tail feather in the eye region is shown in figure. Like the flight feather, the peacock tail feather has a central stem with an array of barbs on each side. 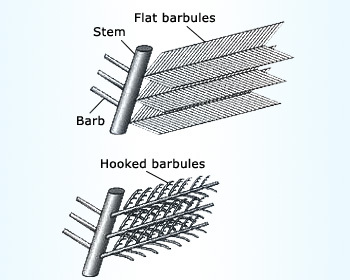 Also, individual barbs have an array of barbules on each side of the barb. Even though there is a basic similarity with a flight feather, the peacock tail feather has an unusual barbule structure. The barbules are like long flat ribbons that overlap to form a flat surface on top of the barbs. (Under a microscope the barbules are actually slightly curved and segmented and the surface has a bubbly appearance). In contrast, a flight feather has narrow barbules, which do not cover the barbs. Other types of birds such as hummingbirds, pigeons and kingfishers have some patches of flat iridescent barbules, but the peacock has the largest iridescent barbules of any known bird. The colors of the barbules dominate the front face of the tail feather because they completely cover the barbs. The barbules are not very visible from the back of the feather because the barbs are quite close together. Thin films as well as the feathers on a peacock produce iridescent colors which change with the viewing angle. Thin–film interference can be produced in one or more layers of a very thin and transparent material. Usually the thin film is placed on a dark surface. The thickness of the transparent material must be close to the wavelengths of visible light. Visible colors have wavelengths between 0.4 and 0.8 μ and thin films typically have a thickness between 0.3 and 1.5 μ (μ stands for micron or a micro meter, which is equal to 10-6m). Another requirement for thin–film interference is that the thin film–must have a refractive index that differs from air so that the light is retarded when it passes through the thin film. 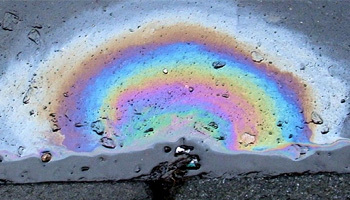 Thin–film interference commonly occurs in oil slicks on a wet road. The oil will often form a thin layer on the wet surface of the road or on the surface of a puddle, the thin–film producing blue and green colors (as shown on the figure). In the case of the peacock, thin film interference takes place in three layers of keratin which cover the barbules. Each barbule is about 60 μ wide and 5 μ thick. The barbules have a foam core that is 2 μ thick and this is covered with three layers of keratin on each side, as shown in figure. The keratin layers are very thin, being about 0.4–0.5 μm thick. 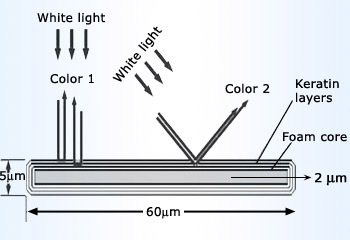 White light is reflected off the front and back surfaces of the thin film. The light, which passes through the keratin is retarded and therefore when it emerges from the keratin, some of the color components of white light are out of phase with the light–waves that were reflected from the front surface. When two wave trains of the same color are out of phase, destructive interference removes the color. In the case of white light, the result of the interference is a reflected color due to the remaining color components of white light. In practice, interference occurs simultaneously in all three thin films. Vibrant colors of a Peacock feather The barbules in the peacock feather contain a high degree of optimum design. The thickness of the keratin layers is optimal for producing the brightest thin-film colors. 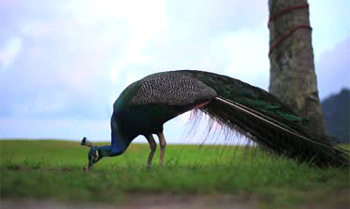 The only pigment in the peacock tail is melanin, which gives the barbs a uniform brown color. This provides a dark background color for the thin–film interference in the keratin layers. The different colors in the eye pattern result from minute changes in the depth of thickness of the keratin layers. In order to produce a particular color, the keratin thickness must be accurate to within about 0.05 μ. 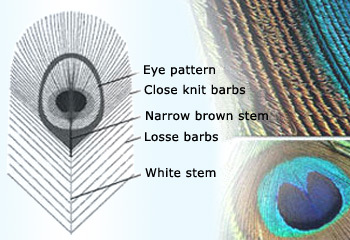 The barbules in the peacock feather contain a high degree of optimum design. The thickness of the keratin layers is optimal for producing the brightest thin–film colors. The dark brown background coloring is optimal because it prevents light shining through the back of the feather. The three layers add to the brilliance of the colors in the feather by adding multiple components of light. The barbules are also slightly curved in the longitudinal direction. This curvature causes a mingling of slightly different colors, which produces a softening of the colors seen in the keratin layers. Examples of such structure–generated colors can be seen in shimmering metallic butterfly and moth scales, beetle wing cases, and the feathers of hummingbirds and birds of paradise. Similar reflective structures made from silica are also responsible for the shimmering color found in opals. Peacock and Peahen Male peacocks shed and re-grow tail feathers each year. The plumage is prized throughout the world as an exotic decoration. The female peacocks would choose their mates according to the size, color, and quality of these outrageous feather trains. 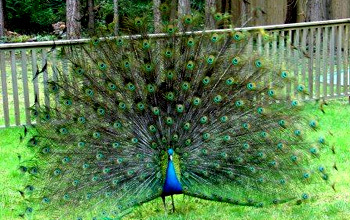 The term "peacock" is commonly used to refer to birds of both sexes. Technically, only males are peacocks and the females are known as peahens, and together, they are known as peafowl. Peacocks are ground–feeders that eat insects, plants, and small creatures. 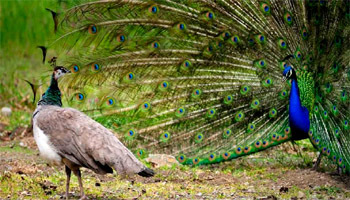 There are two familiar peacock species. 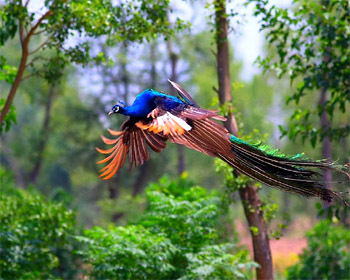 The blue peacock lives in India and Sri Lanka, while the green peacock is found in Java and Myanmar (Burma). A more distinct and little–known species, the Congo peacock, inhabits African rain forests. The formation of an ogee curve from individual barbs is yet another remarkable feature of the peacock tail. Each barb at the end of the T feather has a unique length and curvature and all the barbs coordinate exactly with each other to form the curved T.
A beautiful border to the tail feathers comes from the &apos;T&apos; border feathers as they form an inverse shape of the peacock eye. An inverse shape looks beautiful because the inside T feathers follow the outline of the eye pattern. All the &apos;T&apos; shaped feathers form an "ooge curve" on each side of the feathers. This curve is both convex and concave and hence it would look beautiful. The ooge curves are used in architecture. The end of each T shaped barb has a unique length and curvature which forms a perfect semi circular shape when viewed from a distance. Feeding: The peacock feeds on a variety of food items including grain. They will also consume fruits and seeds that they find but those items aren&apos;t always available year round for them to consume. They consume plants, petals, small reptiles, and even amphibians. They will take the opportunity to eat what they can gain access to. Peacock feeds on grains, leaves and plants They like to eat any kind of green shoots (flowers, veggies, grass etc.) as well as wheat, cracked corn or wild game feed. Males will do all they can to get the attention of females for mating. A male may display his feathers and prance around to get the female attracted to him. Once mating has occurred the female will find materials to create a nest. The males will go looking for other females that they can also mate with. It can take up to 28 days for the eggs to hatch. The young will grow very quickly and within a few days they can walk around on their own. It will take them a few months though to be able to fly. The females tend to stay close to each other and they will help each other with caring for the offspring. In the wild forests they can live for up to 20 years. Peacocks can fly Peacocks can fly but not for long distances. They are good at flying over a fence and maybe up in a tree but they can't fly distances likes a duck or goose. Where are the peacocks found and what is their behavior? The peacock is found in many locations including Burma, India, and Sri Lanka. They tend to live in locations that offer them access to low trees and plants. They also live in regions where they have access to farm grounds for feeding as well. They tend to do better in warmer regions but they can survive in cooler temperatures. They live in groups and the male will often have a harem of several females around him. They don&apos;t do well being around various domestic birds including turkeys. Many people don&apos;t realize that a Peacock is a bird that can fly. Most people only see them wondering around the zoo or as pets. Those particular peacocks have had their wings clipped so that they don&apos;t fly away. They tend to be very social and their groups are referred to as "parties". They will also do well isolated, but it is usually the older males that aren&apos;t with a group. The complexities of their hierarchy can be hard to understand even when plenty of time is spent observing a particular party.